Listen very carefully. I shall say zees only wance. A NEW COMET HAS BEEN FOUND THAT HAS THE POTENTIAL TO BE BRIGHT IN THE SKY IN NOVEMBER AND DECEMBER 2013, BUT WE DON’T KNOW HOW BRIGHT IT WILL BE YET. WE CAN’T KNOW THAT YET! IT MIGHT BE A BRILLIANT OBJECT, OR IT MIGHT FIZZLE OUT AND BE A COMPLETE LET-DOWN. LET’S JUST WAIT AND SEE! Got that? Good. Now, grab a coffee and we’ll chat about what’s actually going on, and what might actually happen. * A comet has been discovered which will make a very, very close fly-by of the Sun next November. 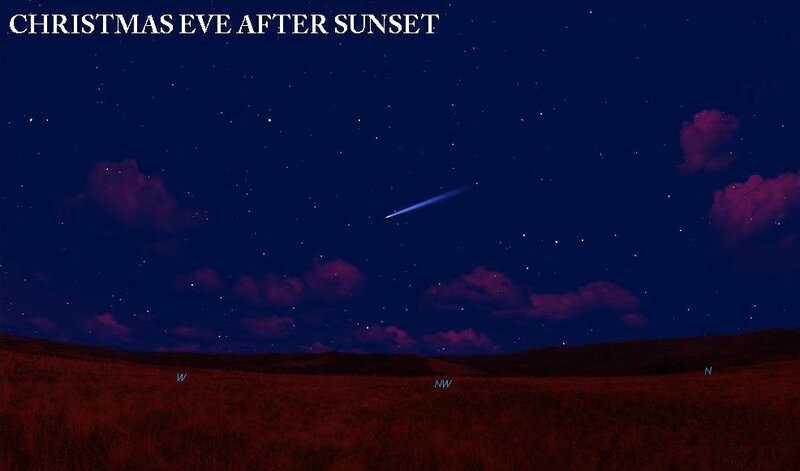 * When it does that, it MIGHT become a very bright, possibly spectacularly bright, naked eye comet in our sky. Perhaps the brightest for centuries. * But we don’t know yet what will happen. Comets are very unreliable and unpredictable, and this comet might yet fizzle out and be a let-down. We’ll have to wait and see. What we do know – and this is all we know really – is where the comet will be in the sky, and therefore where it will be visible from. This time – and I’m sorry, I’m so, so sorry, but I’m feeling very “haha!! !” about this, which is unkind and ungentlemanly, I know, but after missing the last two Great Comets because I don’t live south of the equator I don’t care! – it will be observable from the northern hemisphere when it’s at its best. WHAT?!?!?!?!? Look at that tail!!! The problem with programs like STARRY NIGHT (which are fantastic, don’t get me wrong, that’s not a dig!) is that when it comes to showing the length of comet tails, they’re not to be trusted. They’re essentially software guesses. They don’t take into account the actual viewing geometry at the time, they just airbrush a long, straight tail behind the comet, pointing in roughly the right direction. So, as soon as it appeared (well, maybe a few seconds after!) I realised the depiction of the comet’s tail on that above image was NOT accurate, and when I posted that image, and other STARRY NIGHT renders, on Twitter I was very careful to tell people that. Rahul, while planetarium programs are very helpful to observers in generating cometary ephemerides and plotting such objects’ positions among the stars, they can commonly get things wrong, sometimes very wrong, when attempting to predict the appearance of bright, small q, comets for some future date. 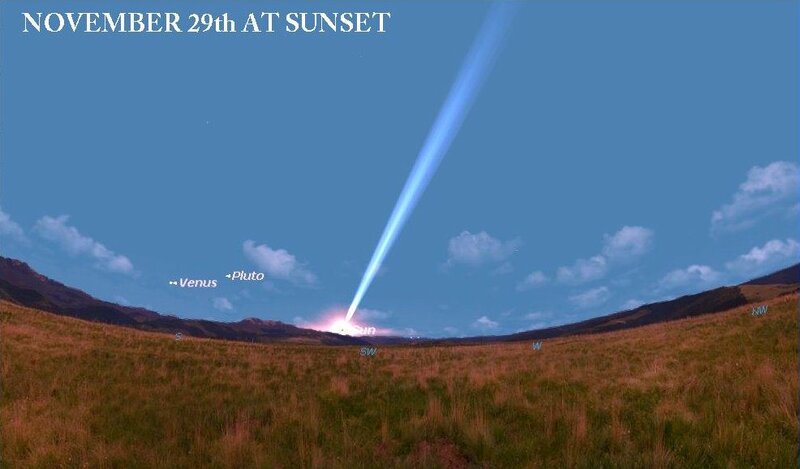 Unfortunately, Starry Nights’ projections for the tail of 2012 S1 on the evening of 2013 November 29 are a classic example of this. Even if 2012 S1 fully lives up to its current hyped predictions, its appearance on the evening in question will be drastically different from the illustration posted on your site. The tails of sungrazing and sun-skimming comets do not track around the Sun in an unchanging linear fashion. As folks will recall, the recent Comet Lovejoy completely lost its tail as it whirled arounded the Sun, thereafter growing a totally new one. Larger sungrazers more commonly will display torturously curved tails (both gas and dust) when passing through their perihelia. The same will surely to be true in the case of comet 2012 S1. The physical situation, one sometimes forgotten by even experienced observers, is that the gas and dust particles ejected from the comet’s nucleus require a finite time to recede from the nucleus to form the tails. The dust particles doing so at a much slower pace than the ionized gas. When the nucleus is traveling at enormous orbital velocity near the time of its perihelion passage, the tail particles are left behind forming a tight arc. 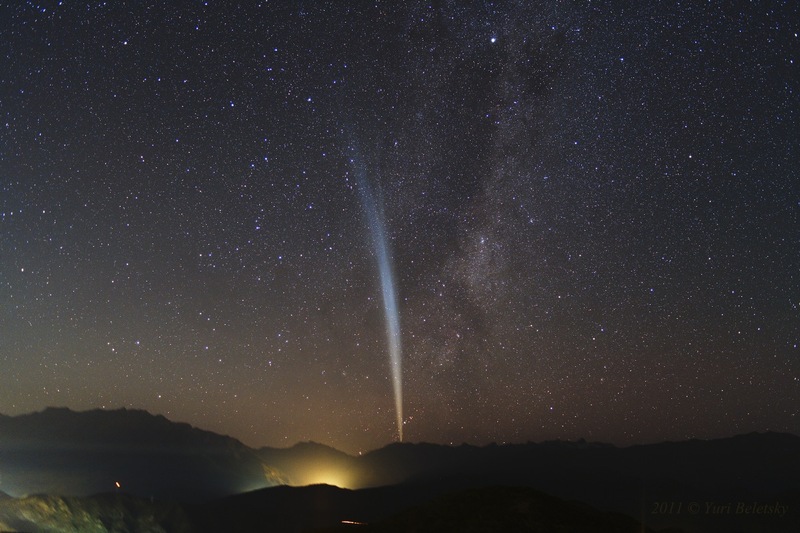 Thus, on the evening of 2013 November 29 the visual tail of comet 2012 S1 will likely be no more than a highly curved stump just a few degrees in length, no matter how brightly the comet’s head may shine. This situation will be compounded by the fact that whatever tail is present will be generally curving AWAY from Earth itself, not toward it. when the nucleus is between 0.8 and 1.0 AU from the Sun if projection circumstances are reasonably favorable. For comet 2012 S1 this should occur late in December with the comet circumpolar from higher Northern Hemisphere latitudes and with the comet’s nucleus nearest Earth. The waxing December moon will pose a problem in the evening sky from about the 7th until a few days past its full phase on December 22. I hesitate to make mention of the fact, recalling events surrounding Comet Cunningham in 1940 and Comet Kohoutek in 1973, but night of comet 2012 S1 most spectacular visual display could well be December 24th or 25th 2013. Now that’s interesting! The tail might be at its most spectacular at Christmas! Where will the comet be in the sky at Christmas..? IF THE COMET BECOMES AS BRIGHT AS WE’RE HOPING!!!! So… here we are… in the frankly fantastic position of having not one but *two* naked eye comets to look forward to next year, because don’t forget Comet PANSTARRS will be gracing our skies in March. Nine months after that, we might all be standing outside in our millions, gazing in awe at a Great Comet blazing in the sky, its tail sweeping across the heavens like a searchlight… or we might all be cursing ISON’s name and damning its memory like people damned Kohoutek’s memory back in 1974.